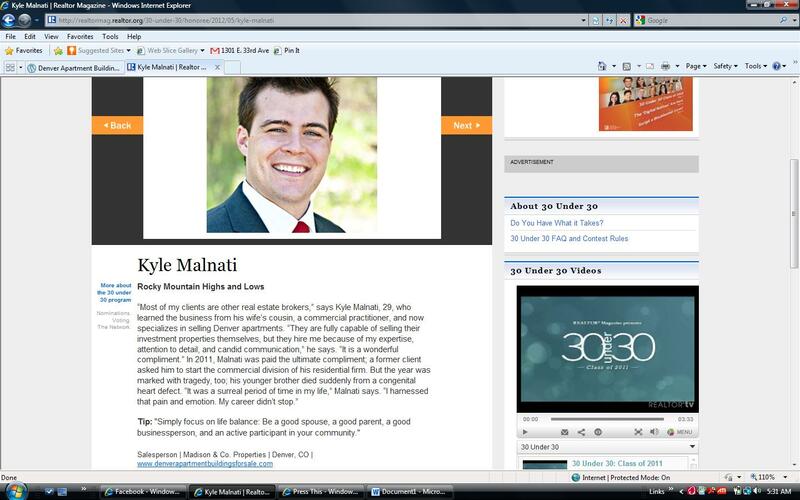 “30 Under 30” Realtors(R) Represent Future of Real Estate Profession. WASHINGTON, DC — Today’s real estate market is challenging and competitive, but this year’s REALTOR® Magazine “30 Under 30” honorees haven’t let that deter them. The 2012 class is following in the strong entrepreneurial tradition of real estate, creating their own pathways to success. The 2012 “30 Under 30” honorees, who are featured in the May/June issue of REALTOR® Magazine, are a mix of broker-owners/managers and salespeople, representing all sectors of the market from commercial real estate to rental properties. Some are immigrants to the U.S., while others practice in the small towns where they grew up. Some were born into a real estate family and always knew they wanted to enter the profession, while others were on a much different career path before real estate came calling. Mandy Becker, a broker-owner of RE/MAX Southern Shores in Myrtle Beach, S.C., originally envisioned herself as a lawyer. Amanda Ruchti, a salesperson with Coldwell Banker United, REALTORS® in Houston, Texas, saw herself as a travel writer. Meanwhile, Seth Goodman, a salesperson with ME Realty in Lincoln, Ill., knew he wanted to follow in the footsteps of his grandfather, a Cleveland, Ohio, area broker. Goodman now has a successful business in his hometown of Lincoln with a population of just 14,500. Many of this year’s “30 Under 30” came into the business shortly before or after the housing market decline. They’ve thrived because they haven’t been afraid to take risks, often at a very young age. Rachel Adler, a salesperson with John L. Scott Inc. in Bellevue, Wash., was 19 when she purchased her first home and — inspired by the young, vibrant agent she worked with — quickly earned a real estate license. Likewise, Inessa Chernioglo, a salesperson with RE/MAX Gold Laguna in Elk Grove, Calif., had just graduated high school when she used her savings to buy her first home. She soon bought and rented out the first one. “Having this experience helps me encourage the younger generation to be wiser with their spending and shows them that homeownership is very attainable if done wisely,” said Chernioglo. Along with taking risks, this year’s honorees are thinking outside the box on how to achieve results in the industry. Brandon Brittingham, a salesperson with Long & Foster Real Estate in Salisbury, Md., developed an REO application for the iPhone that enables real estate professionals to connect with legitimate REO companies. He saw the need after teaching short sale and REO classes for Long & Foster Institute of Real Estate. Timothy Ho, a salesperson with Energized Realty Group in Whitestone, N.Y. and this year’s REALTOR® Magazine Readers Choice Winner, devised a prospecting database system for his team that is both simple to use and sophisticated enough to handle the 200 to 300 calls his office receives each month. Michael Wolf, a salesperson with Ascent Real Estate Inc. in San Diego, Calif., says he is in constant “refinement mode” and looking for ways to better himself. He has written The First Homebuyer Book, and started the company LockBoxSwap.com, where real estate professionals across the nation can buy and sell used lockboxes. One quality that runs throughout the “30 Under 30” class of 2012 is an inherent understanding of the importance of long-term relationships. “If you focus on hard work, ethical behavior, and providing the best service possible you will build a network that sticks with you for life,” said Melissa Kennedy, broker-owner with Lifestyle Estates Realty in Newport Beach, Calif. This year marks the 12th anniversary of REALTOR® Magazine’s “30 Under 30” program. Over the years, 390 rising young stars have been recognized for their commitment and dedication to the real estate industry. Doman Real Estate Services Inc. Complete profiles of all of this year’s honorees can be found on REALTOR® Magazine’s website in the “30 Under 30” section.